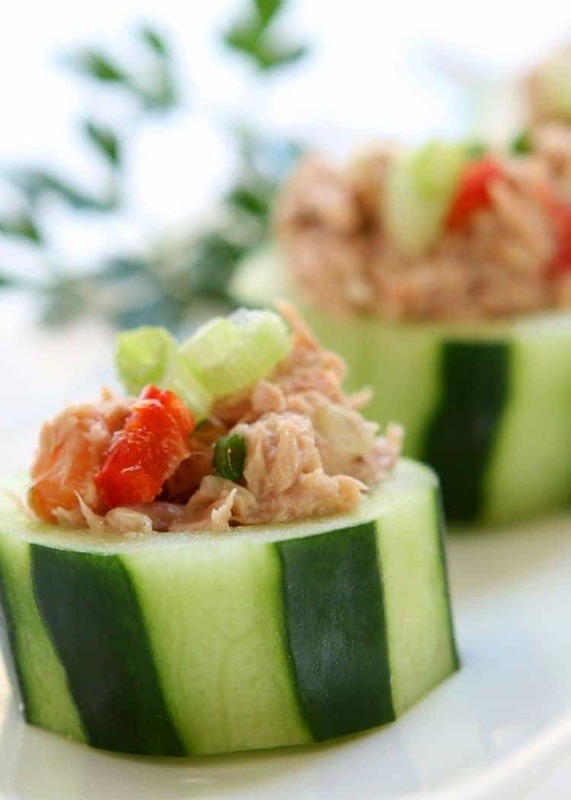 If you love spicy tuna rolls, then you are in for a real treat with these delicious low-carb appetizers. They are packed with flavor and are sure to be a hit at your next gathering. 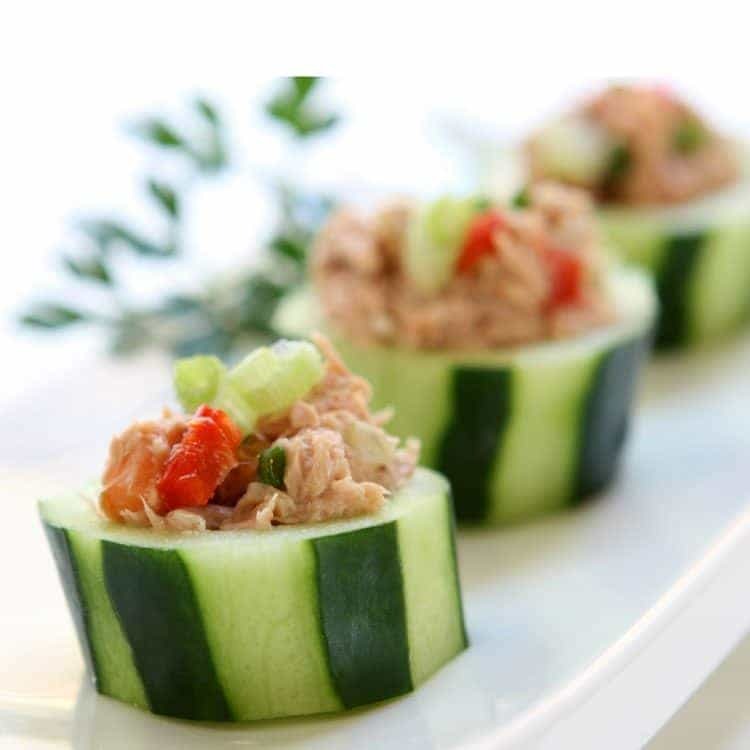 Cucumber cups are easy to make with a cucumber corer. It works perfectly and because of its shape, its so much easier to use than a knife. Note: this recipe calls for Kewpie mayonnaise, which is a creamy Japanese variety made with rice wine vinegar instead of regular distilled. It is available in most grocery stores, or you can order it online here. You can also substitute regular mayonnaise instead. Consider pairing this appetizer up with another one of our favorite appetizer recipes. Some that we recommend are our Gluten Free Shrimp Dip, Black Bean Salsa, and Brie and Dark Cherry Phyllo Bites. Some of our favorite products for entertaining are all of the cute and completely useful individual portion appetizer plates and bowls. These are great for mini-servings of all kinds–we especially love them for mini-desserts. Remove the ends from both cucumbers and discard. Slice each of the remaining cucumber into 6 equal-sized pieces and carefully scoop out the seeds with a small spoon. Discard seeds and set cucumber cups aside. In a small, non-reactive bowl combine mayonnaise, Sriracha sauce, green onions and ginger. Mix thoroughly with a fork. Add finely chopped sashimi-grade tuna to mixture and stir to combine. 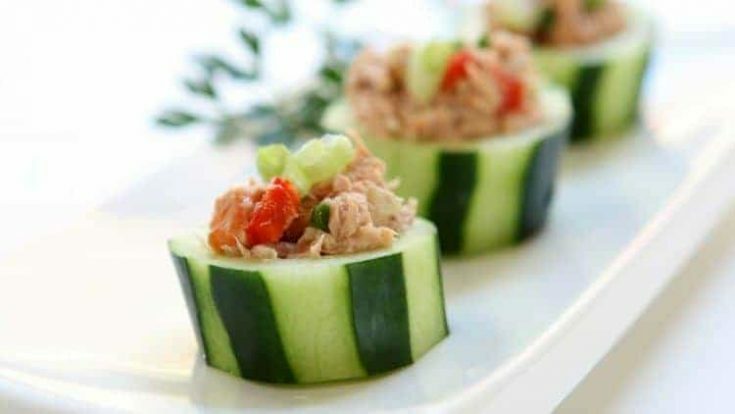 Divide spicy tuna mixture among the 12 cucumber cups and arrange on serving tray. Garnish with sesame seeds, if desired. Serve immediately with pickled ginger, wasabi paste, and soy sauce on the side.